Modulation effects have evolved significantly in past decades. Effects like flangers, phasers, ring modulators, frequency shifters have left a mark on some of the most popular music genres. Moreover, these effects introduced countless new and exciting ways of bending and reshaping the sound. For this reason, I will dedicate the next tutorial to one plugin which has enormous potential in altering and manipulating the sound signal. 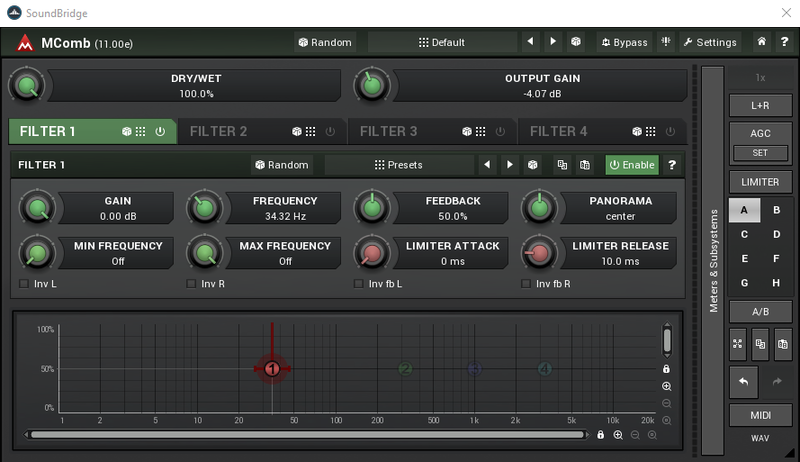 MComb by Melda Productions is an extremely powerful multi-comb filter plugin. Using it’s two extremely versatile modulators it becomes a powerful processor, which can follow a simple LFO, react to input levels, MIDI, input pitch. 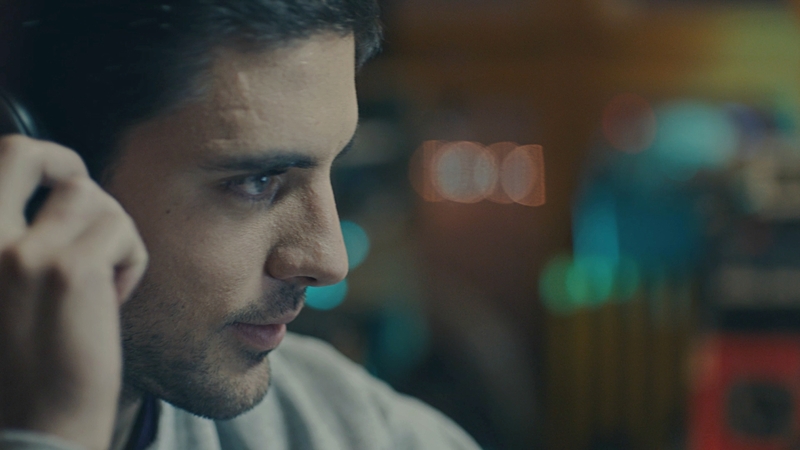 So without further delay, let’s hear it in action. I have created two new audio channels in SoundBridge. One contains a rhythm guitar sequence and another a drum loop. Consequently, I will place a fresh instance of MComb plugin on both channels. Nonetheless, let us first hear how this guitar and drum loop sounds unprocessed. Now let’s explore the Mcomb plugin, which I will use on the guitar first. The interface of Mcomb looks more-less straightforward but don’t let that discourage you. In the top part of the interface, we can see the dry/wet and output sections. Additionally, below are four independent filters, each containing the same parameters. Furthermore, the bottom part is reserved for the graphical representation of the filters. Graph editor includes a graphical representation of the filters. Each point is one filter. Horizontal position is its frequency, and the vertical position is its feedback. The horizontal pull-bar controls its panorama, and the vertical pull-bar controls its gain. In addition to this, if we click on the vertical panel named “Meters & Subsystems“ we’ll enter the sub-menu which contains a useful metering system as well as modulation routing paths. 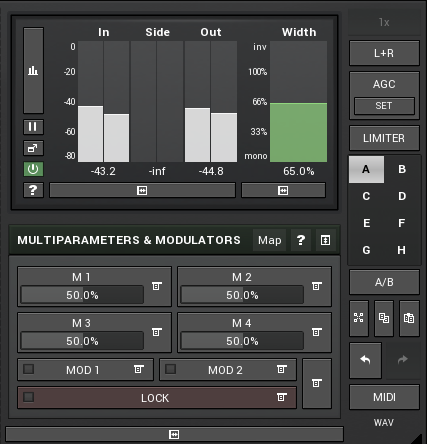 By clicking on “ MOD 1 “ or “ MOD 2, “ we will enter a new and complex modulation panel. Here we have a significant number of options for further sound manipulation. LFO, Pitch follower, Envelope follower, and much more modulation routings could come in handy. Now once we got introduced to MComb`s interface and possibilities let us hear a couple of examples. Here is how it sounds on the rhythm guitar where I just automated the dry/wet parameters, while the LFO controls frequency and feedback from the filter one. Lastly, the final example would be to process the drum loop with Mcomb. 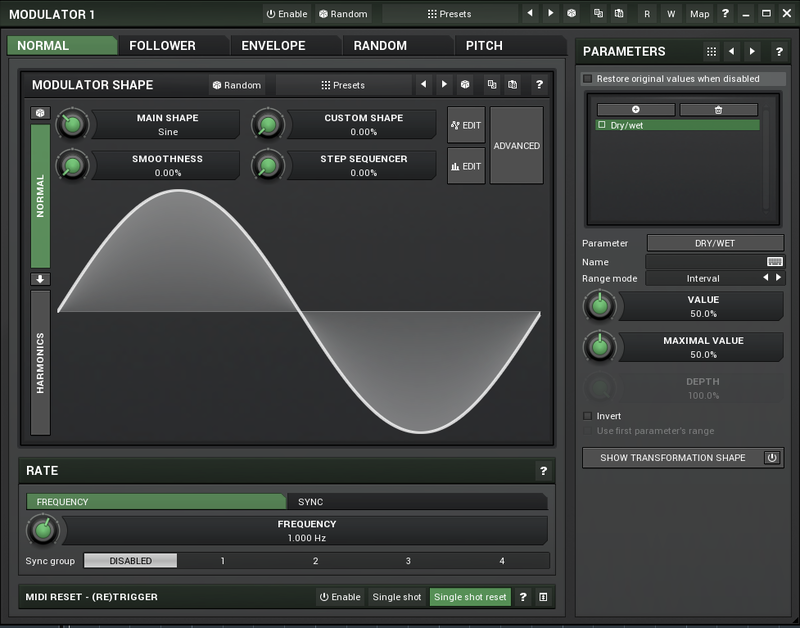 Here I have made a delay-like effect and automated the frequency parameter of the filter 2. Let’s hear how this sounds.